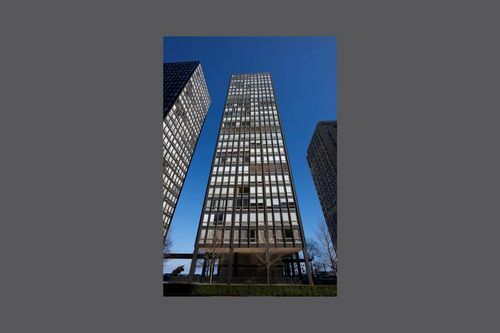 A generation ago the iconic architect Ludwig Mies van der Rohe designed the brilliant glass and stainless steel tower at 860 Lake Shore Drive. Today, The Stainless Steel Apartment designed by Krueck & Sexton is perched atop that building. The intersection of these two works of art is a sight to behold. We imagine Mies (Mr. van der Rohe) would be pleased. This duplexed penthouse appears to float above the lake and city surroundings with its interior elements grounding you as walk throughout the condo. Ahead of their time, Krueck & Sexton created this 3,400 sq ft award winning 3 bedroom plus den with flawless symmetry at every turn. At the center is an interior steel staircase uniting the two floors with perpendicular teal glass columns on one side and stainless steel railings on the other side. Every detail is carefully laid out not obstruct the next. The natural light streaming in all directions showcases the sleek finishes. 1 garage spot included an additional deeded spot $50k.